Presented high school students with cool ways to say no to drugs, so that they can stay on track with pursuing their education and staying on the right path throughout their life. The presentation lasted for 45 minutes. I was also a guide for this same event. I made sure that the children attended the correct discussions, as well as helped the students come up with a change plan to take back to their school during our focus group session. Assisted with facilitation of recovery parade. Parade given in support of clients who are recovering from alcohol and substance abuse. I volunteered to help make balloon animals, serve food, support the face painters, participate in the walk from the facility to the site where the events were to be held, and I also helped with clean-up. The Fall Family Carnival is an annual event at Wichita State.I volunteered to help paint children's faces. It was an awesome experience to know that I helped put a smile on a child's face...literally! Assisted with intakes of clients coming into shelter. Arranged the rooms in anticipation of new client's entering the shelter. Cleaned rooms when client's exited the shelter. Monitored video cameras and ensured client safety while residing in the shelter. Made sure everyone followed the policies of the shelter and completed all chores. Monitored who entered and exited the shelter, buzzed in residents. Answered the crisis line, accessed if client was in immediate danger, and determined elgibility of assistance with facility, referred clients to other facilities and available resources. Assisted with childcare while the residents attended domestic violence group meetings. Distrubted needed clothing and hygiene items to clients. Provided clients access to their medications so they could self administer their medications. Helped distribute socks and various clothing items to homeless individuals and homeless veterans. Provided relief for booth workers. Investigated and Assessed allegations of abuse and neglect of children. Interviewed victims and collateral witnesses. Investigated allegations of truancy. Helped clients problem solve in order to form a resolution to various issues. Acted as a leison between services for clients. Helped arrange for clients to recieve needed services. Performed various background searches. Made referrals for assistance to help empower clients and build on client's strengths. Processed customer accounts. Received inbound calls from customers, vehicle dealers, banks, and insurance companies regarding customer payoffs. Ran vehicle payoffs and faxed them to dealer's and to financial institutions with customer permission. Granted and processed extension. Processed requests for foreign travel, direct-pay, payment history printouts, leads, and insurance quotes. Provided one call resolution and excellent customer service by actively listening to the customer's request or complaint, and using critical thinking to provide an agreeable solution for both the client as well as the company. Mentored new hires, distributed team statistics, and increased team morale and statistics. I am very proficient in recognizing potentially dangerous situations for our clients and myself as a worker. I am growing more confident daily in analyzing a client's situation and brainstorming rational solutions. Although this is a fairly new skill for me, I am determined to become extremely competent in this area, as it is one of the most critical componets of the field. Although I have not been interviewing clients very long as a social worker. I am pretty confident in my ability to ask a client the right questions and to discern the truth from fiction in the response that I receive. I am confident in my ability to build a repoire with a client, especially a child, to get them to warm up enough to talk to me. Proficient in Microsoft Word, Excel, Acess, Powerpoint, PSW, Edsnet, Lotus Notes, Microsoft Outlook, Microsoft Publisher, Faxpress and The Internet. Able to handle multi-line phone system, 10-key, fax and copy machine. Detailed oriented and organized. Customer service certified. Excellent in providing one call resoluton, as well as maintaining client confidentiality. Incredible listener. Wonderful at problem solving and thinking outside the box. Great at analyzing a problem and coming up with a solution that is fair and workable to all parties involved. Created a therapist list to distribute to SRS clients who are experiencing conflicts or may be court ordered to attend therapy; included specialty areas such as: domestic violence, parent & teen conlficts, and behavioral issues in children. Created an individuality video through the use of digital storytelling to represent diversity in social work. 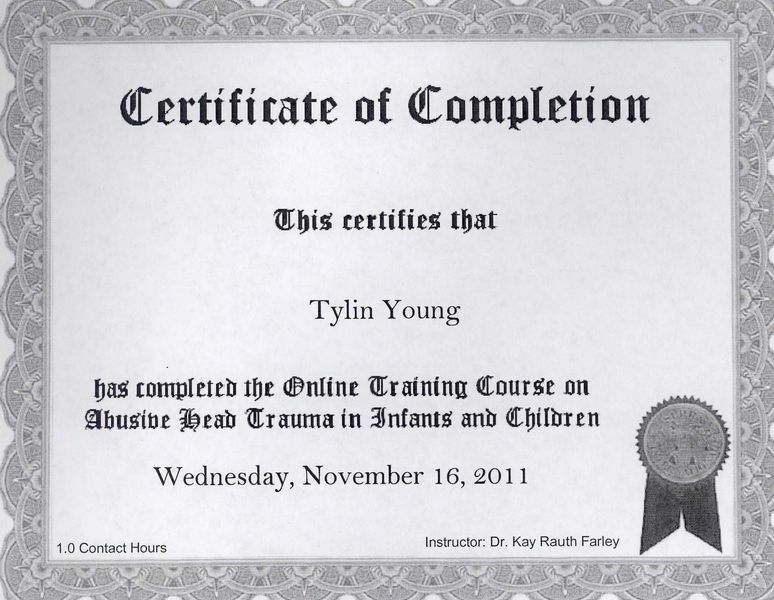 Created a PSA on child abandonment and the need for more awareness of safe havens for infants. To obtain an entry level social service position. I am interested in helping people get back on their feet and maintain their stability. I am passionate about helping families build healthy relationships and preserve their ability to maintain their familial bond in a safe environment. I am interested in giving a voice to so many of our clients who do not know what it's like to have one. I want to bring peace to all of our clients and children who had no other choice than to live in and listen to a world full of thunder! I too want to represent "the last, the least, and the lost of the community!" I am deeply interested in becoming a great social worker! I am also interested in tutoring returning adult college students, mentoring troubled youth, and true rehabilitation and successful re-entry of adult offenders. 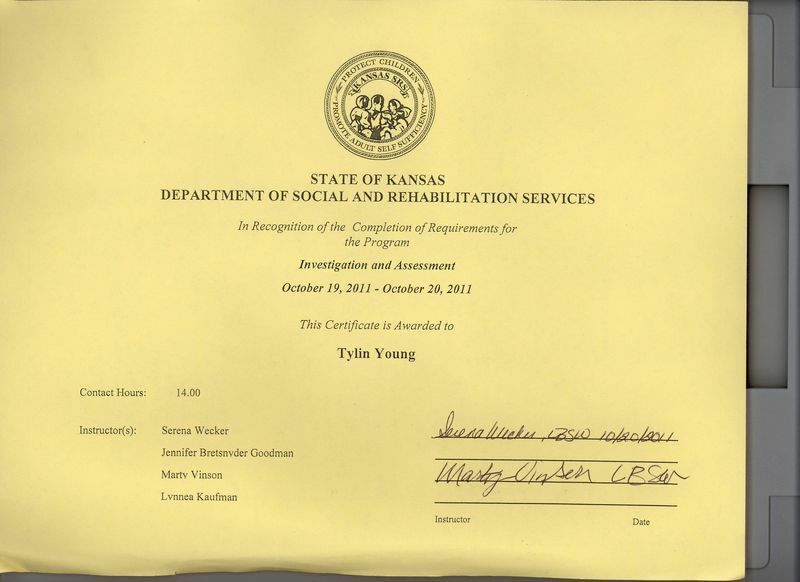 Hello my name is Tylin Young and I am currently attending Wichita State University! I will graduate with a Bachelor of Social Work Degree in May 2012! I am excited to start my career as social service work has always been a passion of mine! I feel that I have a lot to offer this field as I truly care about people! I have excellent people as well as communication skills! I am detailed oriented, observant, friendly, organized, and proficient in a wide variety of computer programs. I am customer service certified, a multi-tasker, and a fast learner. I understand that everyone's situation is unique and that it is best to meet people where they are and help them get to wherever it is they want to be! They say find a job that you love to do and then figure out a way to get paid for it! Well that is how I feel with social work! I am where I am supposed to be! I found the field I love, now when I graduate, I am hopeful that there will be a position open for me so that I can meet my objective of carving out myself a living doing exactly the type of work that I love!